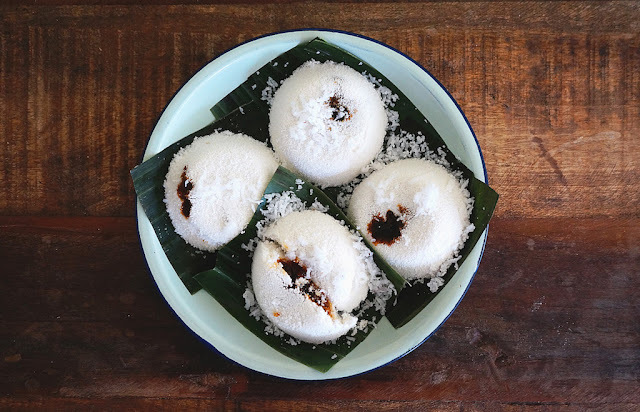 Coconut Filling: In a medium pan, combine the water gula Jawa or palm sugar, cane sugar, and panda leaves. Bring it to a boil and simmer for about 10 minutes until liquid starts to thicken and become syrupy. Add the grated coconut and continue to cook over low heat for about 12 to 15 minutes or until the coconut filling is thick and glossy. Glutinous Rice: Place the soaked rice and Pandan leaves in a baking tin. Steam on high heat for about 20 minutes. Then add in the salt and coconut milk, mix well. Steam the rice again over high heat for about 15 minutes. Remove the rice from the steamer. Place a heaped Tbsp of cooked rice in the center of each banana leaf and place about 2 tsp of coconut filling on top of the rice or on each little square banana leaf and place on top of the rice. Fold the leaf on both sides and tuck both ends under, to enclose the rice. You should be able to see a little but of coconut filling from the top.